James R. Higgins, Jr. is the founder of the firm’s intellectual property law section and also handles business litigation. Since its founding, the firm’s intellectual property law section has expanded into the largest in the state. Prior to becoming an attorney, Mr. Higgins was a Registered Professional Engineer for 14 years with a Fortune 100 Company. He has litigated a wide range of intellectual property and other commercial cases in federal and state courts in 19 different states at trial and appellate levels, including The United States Supreme Court. 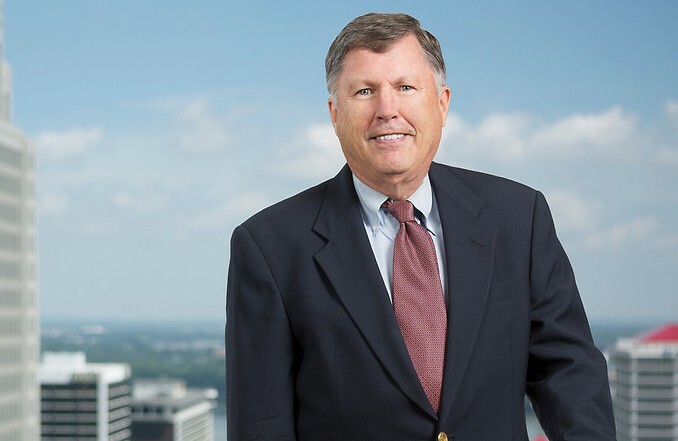 Mr. Higgins is a frequent speaker and author of articles relating to intellectual property law and has been engaged as an expert witness for both patent and trademark matters. He is coauthor of State Law of Trademarks and Unfair Competition (Kentucky Chapter); and Intellectual Property Law in Kentucky (patent, copyright, computer law, trade secret, Internet and litigation update chapters), published by National Business Institute. Mr. Higgins was an adjunct professor at the University of Louisville Brandeis School of Law from 1981 to 1999, where he taught all intellectual property law courses. Mr. Higgins is a member and has served as the business manager of Louisville’s seven time international chorus champions, The Thoroughbreds. He was also a member of a tennis team that won the 1997 national championship at the USTA senior level. Read more about Mr Higgins in this Business First profile. Best Lawyers 2012 Louisville Litigation - "Intellectual Property Lawyer of the Year"
Best Lawyers 2013 Louisville Litigation - "Patent Lawyer of the Year"
In a landmark trademark case, Moseley v. Victoria’s Secret, Mr. Higgins was the prevailing lead counsel in a trademark dilution case before the United States Supreme Court. In a significant patent infringement case, Minco v. Combustion Engineering, Mr. Higgins led a team which secured a judgment in excess of $30 million that was upheld on appeal by the Federal Circuit. In a trademark infringement case, Mr. Higgins successfully defended, in New York City, against claims of trademark infringement, unfair competition and dilution (Columbia University v. Columbia/HCA Healthcare Corporation, appeal dismissed). In state courts, Mr. Higgins counseled and successfully represented a franchisor in fending off a vigorous franchisee revolt. In a "patent troll" case, Mr. Higgins lead a trial team to secure a rare dismissal of a patent infringement case in E.D. Texas.